MAX celebrates 30 years in operation this week! MAX has grown from a 15-mile line to a 60-mile system and 97 stations. During that time, MAX has delivered about 688 million trips! When the MAX Blue Line between downtown Portland and Gresham opened on Sept. 5, 1986, it was among just three light rail lines in the U.S. That first year, MAX carried 9.5 million trips along the 15-mile line. Fast forward 30 years, and MAX now carries more than 40 million trips a year along the 60-mile system, and there are now two dozen light rail systems across the country. Check out this video on the evolution of MAX! During 30 years of MAX, it has provided about 688 million trips. Trains have traveled nearly 77 million miles, the equivalent of nearly 3,100 trips around the equator. More than $13 billion in development has occurred along the entire MAX line since the decision to build in 1980. MAX helps create livable communities, providing an alternative to driving for every activity. MAX carries nearly 1 in 3 rush hour commuters on the Banfield Freeway and Sunset Hwy. MAX Green and Orange lines ease congestion along I-205 and McLoughlin Blvd, respectively. Over the years, MAX has expanded to key destinations like the Portland International Airport, as well as to all major cities, including Beaverton, Hillsboro and Milwaukie, and serves all three counties in the metro area. 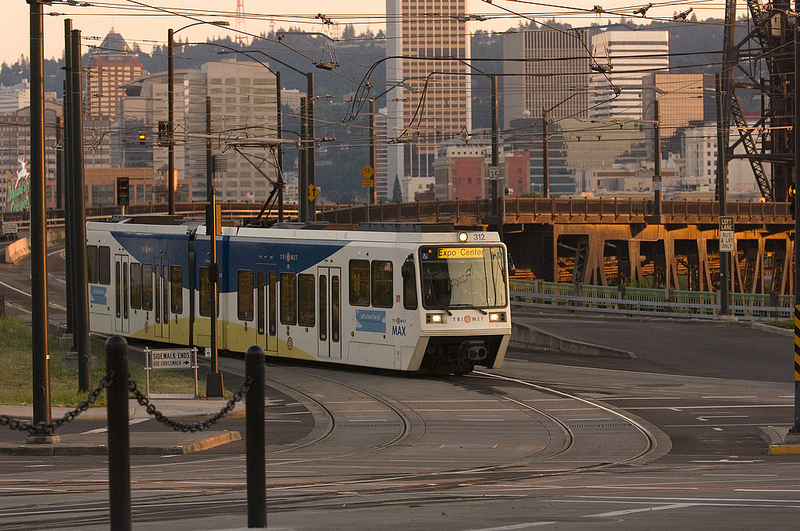 MAX is part of the region’s transportation network, connecting people to jobs, school, community services and activities. MAX and our expanding bus system help keep our region moving. Every day we eliminate 202,000 daily car trips, easing congestion and helping to keep our air clean. Thanks to transit, freight and cars move more freely. In fact, according to the Texas Transportation Institute, our region saves $150 million per year in congestion costs because of TriMet buses and trains. While we celebrate 30 years of MAX, we also look to deliver more MAX and bus service to our growing community. We’re looking to expand MAX to the Southwest Corridor, as well as provide more bus service throughout the region. We’re also investing in our MAX system, upgrading the 30-year system with new tracks, switches and signals, bringing more reliable service to our riders and a more comfortable ride. As we mark 30 years of MAX, we’re continuing to expand our service to help keep this a great place to live, work and play. Thanks for riding!